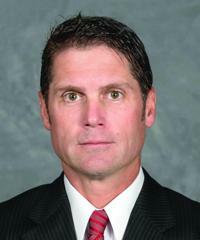 Steve Rohlik, head coach of the Ohio State men’s hockey team, often reminds his players how little each one has the puck on his stick during a typical game. That possession time is crucial. Here are a few tips to improving in those areas. Set up cones and think of them as defenders and barriers. Puck possession doesn’t just mean keeping the puck to yourself. It means keeping it among your teammates. “It’s not just an individual game but a team game,” Rohlik said. And with your teammates, your eyes, mouth and ears are just as important as your hands, hips and feet. “No. 1, work on your vision. Keep your head up. Use your vision to anticipate where you’re able to feel the game and see the ice. Get the puck to an area where one of your linemates can get it. No 50-50 passes. Then where are you going without the puck?